And one of the leading pie manufacturers in the small handheld pie market are the legendary cake and pie makers Mr Kipling. They claim on their boxes to be the nation’s favourite apple pies and to be honest, for years now we have relied on the consistent goodness to keep us filled with pie on many a roadtrip and outing or simply as an easy breakfast or dessert pie option. But it has come to our attention that these reviews are quite old now, being over 7 years since they were pie rated, so they are in need of a review. With so many other pies having been eaten since these initial reviews (some of the first on the blog) are they still that good? Add to the mix that we’ve never actually reviewed the Cherry pie yet and we thought that better change! The question the box poses to us when pie rating is whether the Mr Kipling’s range really is exceedingly good pie? I can assure you – they are! After all, there’s a reason why they are called the nation’s favourite apple pies (their branding and claim to fame, not mine). And there’s got to be a reason we keep going back to them time and time again! Packed with crisp apple-y goodness, the Mr Kipling Apple Pie ticks all the boxes and ensures it is the premier portable snack sized fruit pie. The apple and blackcurrant pies have a nice sweet mix of apple flavouring balanced with small pieces of blackcurrant (though the seeds can get in your teeth at times!) and the cherry pie is also nice and sweet, though again no fruit pieces to get your teeth into. Sadly none of these pies have a particularly strong natural fruit content with pieces of fruit in your pie, relying more on a fruity jam like consistency. The capacity of these pies is also quite low – though if you eat one you’d probably agree you don’t want much more sweet filling if you’re going to finish said pie! But then this has been the case in nearly all of the small, portable fruit pies you get from supermarkets and similar companies. However if you want pies with actual pieces of fruit in, it’s best to go for pies from bakeries or farmers markets, which tend to be sold in larger sizes to cram the fruit in! 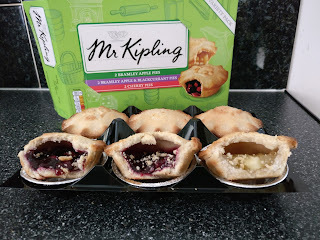 In summary, whether on a roadtrip, at a cake and pie sale, having just played sport, or at a friend’s leaving meal... the possibilities for cracking out a top tasting Mr Kipling Pie are almost endless! In terms of the small fruit pie market they are one of the best out there, consistently available across many supermarkets and corner shops up and down the country. And there has certainly been no lack of consumption of these pies in the past 10 years or so (easily pre-dating the creation of the Pierate Blog!) I would make a relatively safe guess that between the Pierateers there have been well over 200 Mr Kipling Apple Pies eaten alone (often all 6 in a pack eaten in one group sitting), which make these surely the most eaten pies in Pierate history!